The commuter train line of Malaga has its origins at the beginning of the 20th century. Today the suburban line C-1 runs just over 31 kilometres along the western Costa del Sol linking the cities Malaga and Fuengirola along 18 stations in the municipalities of Malaga, Torremolinos, Benalmadena and Fuengirola. Announcements of stops are made in English and in Spanish. The suburban train station in the city of Malaga offers free WIFI to passengers for half an hour, plenty of time for those waiting for the next train. This measure will be very appreciated by the large number of tourists who do not have national coverage so they can use Internet while waiting at the station. The train ticket can usually be purchased at a vending machine; in the event that the machine does not work or you don´t have a 20 Euros note or less the sum must be paid directly to the reviewer with a small extra charge. There is the possibility of pursuing season tickets if you use the commuter train line often. * This is the current price as for today which may vary. There is the possibility of pursuing a season card if you use the commuter train line often. You are required to register in advance and the card will take 1 week to be available. You can also buy a 10 trips ticket from the vendor machine. This ticket is valid for the commuter train for a month since the buying day. It is cheaper if you plan to make 10 trips and can be shared on the same trip by several people. *Note: Because this ticket is confusing for many I will give an example below. If for example 5 people make a round trip for 3 zones, the price for this ticket would be 13.85€ instead 20.05€ when buying a single one for each, much cheaper. The start of the line and the closest stop to the centre of Malaga, shopping centres, Port of Malaga and shopping areas. This stop connects to the main railway station in Malaga María Zambrano with middle-long distance trains, AVE high-speed train and access to Malaga subway. This train station occupies the former San Andres stop since 2009 and where stops in addition to the commuter train a daily train to Ronda. The C-1 suburban train line connects the municipalities of Málaga, Torremolinos, Benalmadena and Fuengirola. It is a line used by both tourists and the people of Malaga. The train frequency is usually 20 minutes. The entire journey takes 46 minutes. First trains on the C-1 suburban line departing from Malaga city centre station and heading towards Fuengirola. This station is close to the city centre and some malls in Malaga. Last train arrives to the station at 1:06 am. Connection with the main train station in Malaga, María Zambrano and the Vialia shopping centre. It is also located next to the Malaga bus station. Formerly known as San Andrés train stop, this renovated station is located near the Malaga fairgrounds. This train stop is located inside the Guadalhorce Industrial Area, where you will also find the Malaga Nostrum shopping centre. Check our guide about Malaga airport trains for more information. San Julián is located within the municipality of Churriana and has not been operational for some time. There is a Decathlon and a Leroy Merlin shop centre near this area. The Plaza Mayor train stop is located next to the shopping centre of the same name and Mediamarkt. *Note: You can also walk from this stop to the Bahia Azul Shopping Park (located in front of Plaza Mayor) where IKEA, Worten, Maxcolchon, Visionlab, Prenatal, Jysk, Schmidt, Maisons Du Monde, Conforama and a McDonald are located. This stop is located in the urbanization of Los Alamos within the municipality of Torremolinos. Near this stop is the private health center Santa Elena. Located a few minutes from Los Alamos, near the urbanization of the same name. Nearby are McDonalds, schools and golf courses. Near the station is situated the busy Calle San Miguel, filled with shops of all kinds and extending to Playamar on the beach. From the bus station of Torremolinos you can connect with different municipalities as Marbella, Mijas or Churriana. The station does not have an elevator so it is not suitable for disabled people. This stop is located in the urbanization of Montemar, near the Carrefour shopping center and the family Bateria Park. This stop is located next to the urbanization "Vistas del Pinillo", within the municipality of Torremolinos. It is located near the Carrefour shopping centre and the Torremolinos industrial area. This train station is located in the town centre of Arroyo de la Miel and is a station located below ground level which can be reached by lifts or stairs. Near the station is the Parque de la Paloma, the Benalmádena cable car, the Tivoli World amusement park and the Plaza de la Mezquita, a good place to have a drink. It is connected by bus with Benalmádena Costa, Mijas and Torremolinos. Located in the urbanization of the same name within the municipality of Benalmádena. It is also one of the stops near the beach. Train stop located in the urbanization of the same name within the municipality of Fuengirola. Carvajal is a quiet area frequented by tourists looking for a good day at the beach. In the Torreblanca urbanization you will find this train stop within the municipality of Fuengirola. It is near of a supermarket, a Japanese restaurant and also close to the beach and the Fuengirola promenade. Above ground train stop in Los Boliches, Fuengirola. Access to the platform is from the side through an overpass over the road. Near the beach and the shopping centre El Corte Inglés. 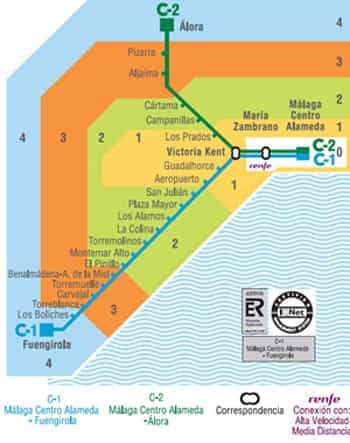 Although its extension to Estepona is planned, it is currently the end of the C-1 suburban line. The last train arriving in Fuengirola is at 12:16 am. The C-2 suburban line connects the municipality of Malaga with several inland towns. The estimated time from 'Centro Alameda' station to the last 'Alora' station is between 38 and 45 minutes. The frequency of trains on this line is about every hour. The C-2 suburban line shares the first three train stations with the C-1 line. Pay special attention to the side of the train where it indicates the final destination of the line. The last train arrives at Malaga station at 11:25pm. Active station since 1863 after the start of the train line between Malaga and Alora. Located on the same stretch of train line between Malaga and Cordoba, the station was inaugurated in 1863. From the station Cartama you can take another middle-distance train between Malaga and Ronda. Within the municipality of Cartama is situated this train station. Through this station runs the middle-distance train that connects Malaga and Ronda. Prime destination for those wishing to visit the Caminito del Rey but remember that currently you have to make the reservation online. The last train to arrive to Alora is at 10:20 pm. Formerly there was a stretch parallel to the sea opened in 1908 linking Malaga with Velez-Malaga, which was unused in 1968 and of which still can be seen in the landscape some of its old stations; the project aimed to link Malaga and Almeria but never materialized. Another of the sections that ceased to exist was the one linking Malaga with Coin and was intended to link Malaga and Seville. It is intended to expand the route from Fuengirola to Marbella and Estepona, reaching to connect with San Roque and Cadiz at the western end. On the eastern end it is intended until Nerja and perhaps connecting with Granada; still there are no concrete dates of the project.